The Jungle Book is notable for being the first Disney film released after Walt Disney’s death. Its release became a potential litmus test to see whether Disney animation could survive without Walt. Luckily, it was successful. It’s also interesting to note that Frank Thomas & Ollie Johnston animated 50 percent of the film themselves. I like King Louie, who, if you watch the above video, you’ll see was heavily influenced by Louis Prima. Ultimately, Mr. Unkrich is probably right in his great ape assessment. If you prefer your apes to possess more human-like qualities, chimps take the cake, genetically and behaviorally. I doubt an orangutan could ride a Segway, or look this good in overalls. Probably good to stick with bonobos, too, because common chimps can be less friendly. Not to mention that male orangutans can be quite monstrous. 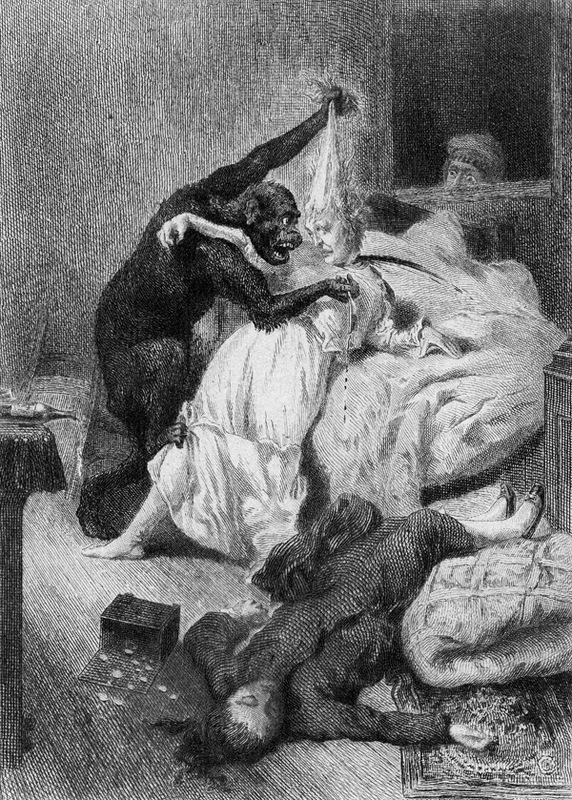 Edgar Allen Poe’s detective story, The Murders in the Rue Morgue, features a murderous orangutan. He uses a shaving razor.